Buy De Wit diamond headed hoe: <ul><strong><li>Razor-sharp tough carbon steel blade</li><li>Longer-length handle prevents back strain</li><li>Lifetime guarantee</li></strong></ul><br>Tackle weeds below the soil line with ruthless efficiency with this exceptionally sharp De Wit diamond-headed hoe.<br><br> With a slimline carbon steel head sharpened on all sides, the hoe slices through weeds on both the outward and return strokes. Slide it firmly back and forth below the soil's surface and it will cut through every root in its path.<br><br>The head is fitted to a 1.6m long solid ash shaft to reduce bending and back strain, and the slanted P-grip handle gives you a secure, comfortable grip.<br><br>As the handle will naturally shrink over time, a locking nut fixes the head in place - letting you simply re-tighten it to keep the tool solid and strong.<br><br>Measurements:<br>Head 5cm long x 21cm wide (2.1” x 8”)<br>Total length 160cm (63”)<br><br><strong>About De wit tools</strong><br><br>The Dutch are renowned for making the world’s finest garden tools, and De Wit is the most respected name of all. Founded in 1898, the family-owned toolmaker combines old-fashioned quality and craftsmanship with innovative design to create superior tools that last a lifetime.<br><br>Every tool is hand-forged in the Netherlands from tough boron steel - shaped, sharpened and burnished for durability, giving it the same blackened patina as traditional Edwardian tools. Each is fitted with an FSC-certified solid ash handle for ultimate strength and shock resistance, oiled to provide first-class protection against the elements.<br><br>All De Wit tools come with a lifetime guarantee against manufacturing defects, making them a truly once in a lifetime purchase. 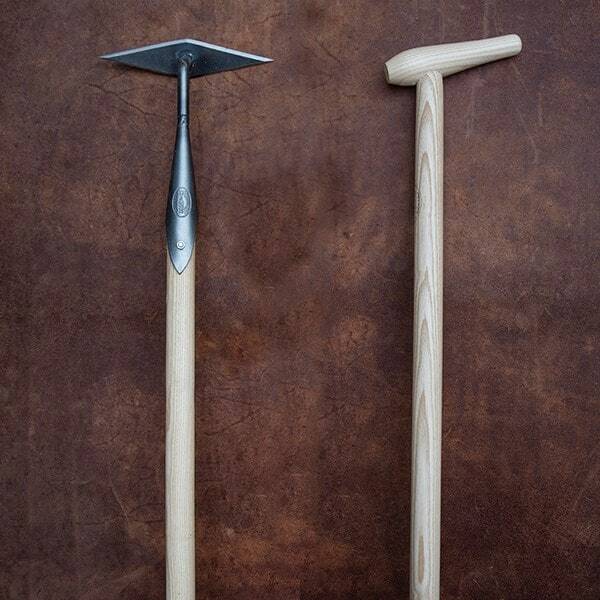 Excellent little hoe for inbetween plants - great for ground elder! 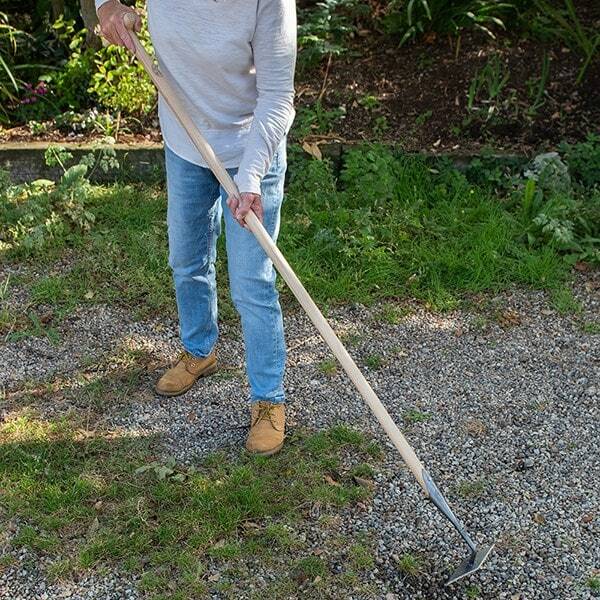 This gets lots of use on the allotment and makes weeding between crops a breeze. Help with weeds Weeds are making my life a nightmare. I want to plant more shrubs this year but should I risk doing that if there are weeds in the border? Any advice would be much appreciated. 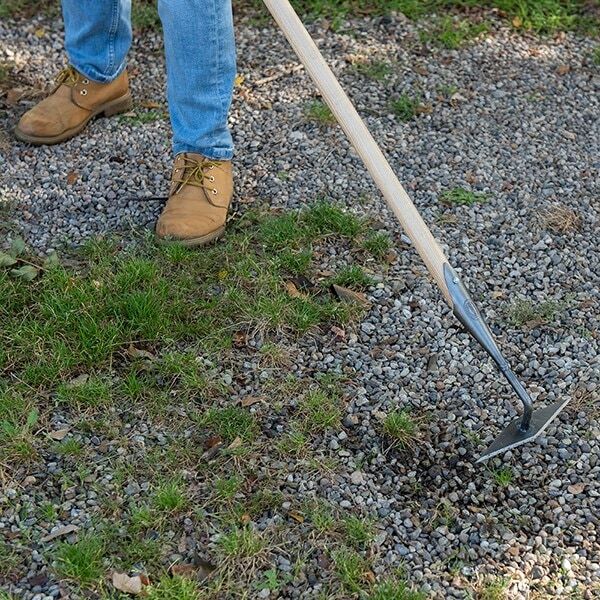 Make sure you dig up weeds before they flower and set seed. The easiest way to do this is to hoe between permanent plants when the weeds are still small. Hand weed around the emerging shoots of bulbs and herbaceous plants to prevent damage.